Seems random for a musician to post, I know, but it actually performed quite well and exceeded our expectations. This month’s blog is going to be a bit different from what I usually post since I didn’t have time to work on something while I was in Japan. 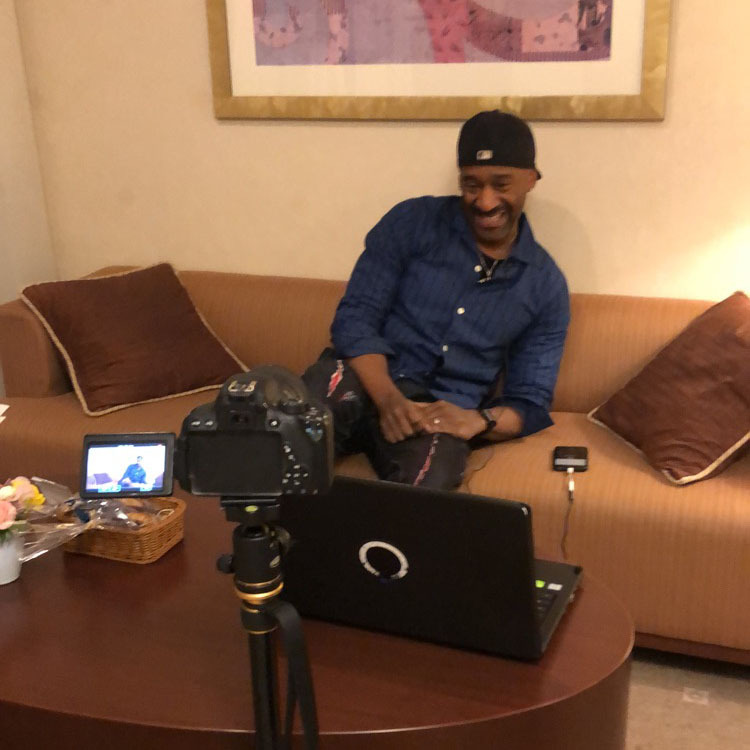 I’m going to share my experiences working with Marcus Miller on things like that ramen video and touch on some key points on content creation. My original plan was to do an in depth blog and e-book on content creation for music artist, but this could be a nice introduction for it. I’m going to use Marcus Miller as a case study for creating content so it can help you think about how you approach your content. I imagine many people reading this won’t know who Marcus Miller is. To be honest, I didn’t know who he was either, due to the fact that I don’t listen to jazz. I learned that he’s a top bass player who has worked with Miles Davis and other many other big names in music. You might think that this blog doesn’t apply to you because you may not have 600k+ Facebook followers. Or simply because you’re not a legendary jazz musician. However, I still believe there’s something to learn from this, even if you don’t have the fan base, brand or reputation he has. Because of the type of music he does and the generation he comes from, Marcus hasn’t really made the most out of social media. They’ve had a Facebook page since 2010, but only recently created an Instagram account in 2015. Even then, they weren’t really active on Instagram until May of 2018. In other words, they are still learning and exploring what works for them. Content and content marketing have been big buzzwords within the online marketing world for many years now. For those not familiar with the concept, this is a good starting point. Otherwise, you can jump into the next section. The goal of content is to either inform, engage, educate or entertain the consumer. Through this blog I publish on, I create content that aims to educate and inform artists and musicians like yourself. The thing is, this idea of creating content to build an audience or fan base has been around for a very long time with traditional media (TV, radio, print). Articles in a newspaper or magazine is content that is meant to get your attention so companies can get ads in front of you. It’s no different than media companies (before Netflix) creating TV shows for you to watch in order for them to make money off advertising. In this digital age, we have the ability to quantify it much easier and accurately with social media followers and subscribers. In fact, as an artist, you have the tools and ability to become that TV station, magazine or newspaper. It’s important to understand that as a music artist or musician, you are a content creator. The songs and music videos you create are content. Typically, that is the extent of what musicians put out on social media, but it doesn’t have to be. As an artist and brand, you should see yourself as a media company. Social media is your distribution channels for the content you create. What you decide to create should aim to reach new people, deepening relationships and defining your brand. Your music is always going to be a big part of it, but you don’t have to be limited by it. By thinking of yourself as media company, I believe it’ll allow you to build your brand and grow your audience more effectively. Prior to the shooting of the ramen video, we discussed and shot a few other pieces of content related to the Japan Tour. With Butterscotch as a special guest, we did an intro video where they did a little beatbox and bass jam. The idea was to showcase Butterscotch to Marcus’s audience since the tour was promoting her as the special guest. I put some clips of them performing together during soundcheck and the live show which we ended up posting on their channels. A fun idea I’ve thought about was Butterscotch teaching Marcus how to beatbox while Marcus teaches Butterscotch how to play the bass. I didn’t think Marcus would do it, but Brenda ended up suggesting it, and he was down for it. We recorded on my phone but we haven’t posted it yet. I think it’ll be a fun video to share so I’ll be updating the blog once they post it. 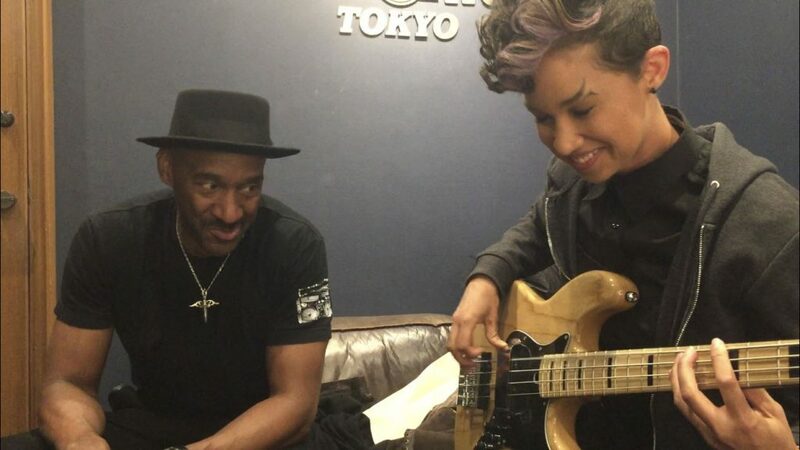 Screenshot of the video Marcus teaches Butterscotch to play the bass. We also explored other ideas outside of music. Kohshin Satoh, a Japanese designer who worked with Miles Davis during his later years up until his death, provided clothes for Marcus to wear for this tour while I was there. Because they both worked with Miles Davis, I recorded some of the interaction between the two of them. While Marcus tried on his clothes, he shared a bit of history of the relationship between Kohshin Satoh and Miles Davis. Screenshot of the video I made of them together. Because of this Miles Davis connection, we thought it’d be interesting content. It hasn’t been posted it yet, but I’m curious to see people’s response. I also recorded some footage of Marcus trying on Kohshin’s clothes, looking into the mirror and doing some funny gestures. It was all unintentional, but we thought it’d be a funny idea to have him do voice overs for the footage as if he was talking to himself in his head. I ended up recording the vocals later in his hotel room. Like the other ideas, the only thing posted has been the ramen video since it was more timely with him in Fukuoka. Marcus Miller recording voice overs for a video I recorded. Before I get into the ramen video, most of the content ideas were premeditated. A majority of it was just being able to come up with ideas in the moment and recognizing the different opportunities based on what’s going on. The night before we flew into Fukuoka for their last show, I was told by a local in Nagoya that this is where popular ramen chains like Ippudo and Ichiran first started. As a big ramen fan myself, I was excited to try it at the original locations. My first idea was to have Marcus and Butterscotch eat ramen at one of these places together and document the interaction. Unfortunately him and his wife got lost, so I ended up eating with Butterscotch and the band. It just so happened that they were playing jazz music. When they eventually found us leaving, I stayed back to film Marcus trying out Ippudo for the first time on my phone. The fact that they were playing his favorite era of jazz music in the background, was a perfect tie in for the video. Surprisingly, the video did really well and exceeded our expectations considering the video was 4 minutes long of him eating ramen and commenting about the music playing in the background. It’s quite slow with a few funny parts of him not knowing how to open the door and struggling with the noodles. As of the publishing of this blog, the video has hit about 157k views on Facebook. It’s the third highest viewed video he’s put out. The two videos with higher views are extremely good pieces of content, one related to his father, and the other was a video clip of him playing with Verdine White (Earth, Wind & Fire). Although he’s only put out about 27 videos on Facebook since joining in 2010, there’s no way this ramen video would have topped these two other videos. I share my thoughts on why and what makes it good content. The video is a song dedicated to Marcus Miller’s father, who recently passed away in 2018. Aside from the beautiful song in this 11 minute video, he starts off by sharing an amazing story about his father and the context for the song. It’s a touching and emotional video considering he posted this for Father’s Day. When you share something like this with a lot of sentimental value, it tends to get good engagement. This should be obvious when you share content that triggers strong emotions. For those who know who Verdine White is, this would be considered a somewhat epic video. I honestly didn’t know who he was either until last year when Butterscotch opened for Earth, Wind & Fire. Verdine White is the bassist for Earth, Wind & Fire and one of the original founding members. 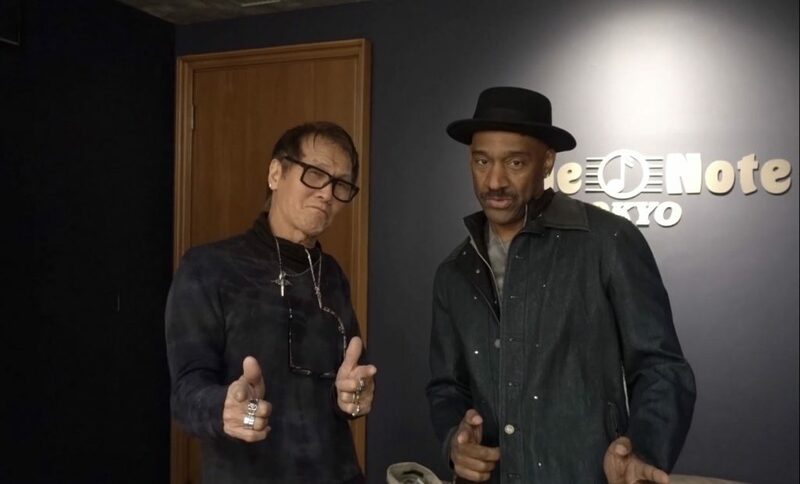 In the video, Marcus Miller jams out with Verdine White during an Earth, Wind & Fire set in Japan a few years ago. Live show footage tends to be overdone and get boring when posted, unless there’s something cool, novel or unique about the experience. For this video, it was great to have two legendary, bass players jam out together so you can see why it got a lot of traction. When accessing if a piece of content is successful, we have to remember that it’s not all about views. For platforms like Facebook and Instagram, a view is counted when someone watches a video for 3 seconds or more. Watching something for 3 or even 10 seconds isn’t going to get you the impact you want from a piece of content. What we should be evaluating is the engagement numbers, such as comments and shares in relation to the number of views. Likes aren’t as valuable because you can just click a button and without really having to watch it. Essentially you just divide the engagement metric (likes, comments or shares) by the number of views and multiple by 100 to get the engagement rate. This just tells you the percentage of people who take an action from viewing the video. Even though the ramen video had a higher rate of likes than the other 2 videos, it doesn’t compare to the other two important metrics of comments and shares. It got more views, but the ramen video didn’t really activate viewers the same way as his top performing video, the Preacher’s Kid. I know this breakdown is on Facebook and I believe Instagram is the more important platform at the moment, especially for more of the younger artists out there who are reading this. Instagram doesn’t have a share metric, but hopefully this section demonstrates how you might evaluate a video’s performance. Conclusion: What can you learn from all this? 1) Being an artist or musician today isn’t all about music. One of the very common themes I write about in my blog is the idea of building a brand. A brand can have, and should have, different facets to it outside of just the music. Of course, as a newer, less established artist, this may not be an easy process. I’ve written a lot of blogs on branding so I suggest checking them out. Even though a video of someone eating ramen is a bit random, it was still entertaining and relevant to Marcus Miller’s audience because of the jazz music playing at the ramen shop. Most musicians reading this won’t necessarily recreate his success if they just went to some ramen spot and record themselves eating it, but I think the more important message is how the idea came about rather than the idea itself. The ramen video I shot and made was all done on my iPhone on a gimbal. I used an app called ProCam to capture the footage and pieced it together with the app called inShot. It’s really amazing what you can do with just a smartphone nowadays. Don’t think you need expensive equipment or software to make good content. The trend I’ve noticed is that people seem to respond more to lower production value because it comes off as more authentic and personable. 3) Don’t worry about the length of the video. The average attention span for humans in our digital age is about 5 to 8 seconds. Generally you want keep things as short and to the point as possible. People who are scrolling in their timelines or news feeds aren’t necessary there to watch long pieces of content. However, don’t let this dictate the length of your video. If the content is good, it shouldn’t matter how long it is (within reason of course). Obviously on Instagram, you are limited to a one minute video unless you post multiple one minute clips. For longer videos, it belongs on Facebook or YouTube. The ramen video was slightly over 4 minutes. It has its moments, but it does drag a little bit. In the midst of getting this video out quickly, I didn’t have a chance to really review the video otherwise I would have shortened it a bit. Don’t get me wrong, it did well, but just don’t fall into this idea that everything has to be short and quick. One of the things that we theorized was that Marcus Miller’s audience doesn’t really care about anything other than seeing him play the bass. Because his fan base tends to veer towards an older crowd and generation, we figured they may not cared to see him eat ramen or show his personality outside of the music. The big key takeaway from this blog should be to experiment. You still want to try to tie your content to either your music or brand. We had no clue that this ramen video would perform the way it did. You just don’t know until you try. When experimenting, try spacing things out so people don’t get thrown off from what they are used to seeing.